Cultures Direct Press, 9780692215180, 192pp. Learn something new today from the wisdom of Afghan Proverbs with 'Mataluna', the much-anticipated book of Afghanistan's top Pashto Proverbs. Collected and written by Edward Zellem, the 12-time award-winning author of 'Zarbul Masalha: 151 Afghan Dari Proverbs' and 'Afghan Proverbs Illustrated'. 'Mataluna' ('Proverbs' in Pashto, one of Afghanistan's two official languages) is the first and only book of its kind. It is a unique multicultural and multilingual collaboration between an American naval officer, an Afghan high school, and native Pashto speakers from all over the world. It is the essential companion to Captain Zellem's acclaimed series of bilingual Afghan Proverbs books in Dari, English and over a dozen other languages. 'Mataluna' features 151 commonly used Pashto Proverbs and 50 original illustrations by Afghan high school students. The book is bilingual in English and Pashto, and includes Pashto script, English translations, and transliterations for easy pronunciation. Afghan Proverbs are gaining global attention like never before, and 'people-in-the know' see instantly that they rival the great sayings of Confucius and other world-renowned philosophers. Be the first person you know who can quote an Afghan Proverb in a conversation. 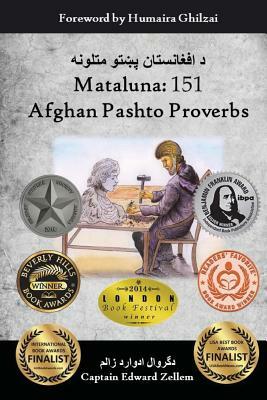 Learn more about the true nature of Afghanistan and its people with 'Mataluna: 151 Afghan Pashto Proverbs'. Captain Edward Zellem is the award-winning author of three bilingual books of Afghan Proverbs, now published in 18 languages as a personal project. He is a U.S. Navy officer and trained Dari speaker who spent every day for a year and a half on native Afghan teams in Afghanistan. This included a year on President Hamid Karzai's staff inside the Presidential Palace of Afghanistan. While in Afghanistan, Captain Zellem became fascinated with the way Afghans use Proverbs in their daily conversations. He began collecting and translating them, and used them every day with Afghans in his professional and personal life. After students at a local Kabul high school offered to create illustrations, he decided to publish his English-Dari collection and share it with the world. His groundbreaking first book, 'Zarbul Masalha: 151 Afghan Dari Proverbs' and his second book, 'Afghan Proverbs Illustrated', have received international acclaim and a wide multicultural following. When Pashto speakers (Afghanistan's other major language) asked for an edition of Pashto Proverbs as a companion to his Dari Proverbs books, Zellem spent over a year personally collecting the best Mataluna from native Pashto speakers all over the world. The result is now 'Mataluna: 151 Afghan Pashto Proverbs'. Learn more about the author and Afghan Proverbs at www.afghansayings.com.